Implement ITIL and ISO 20000 yourself, and do it easily and efficiently with our Documentation Toolkit. Our ITIL and ISO 20000 expert will meet with you regularly – he will tell you where to start, what the next steps are, and how to resolve any issues you may face. You can meet via Skype, over the telephone, or through any other means at your convenience. 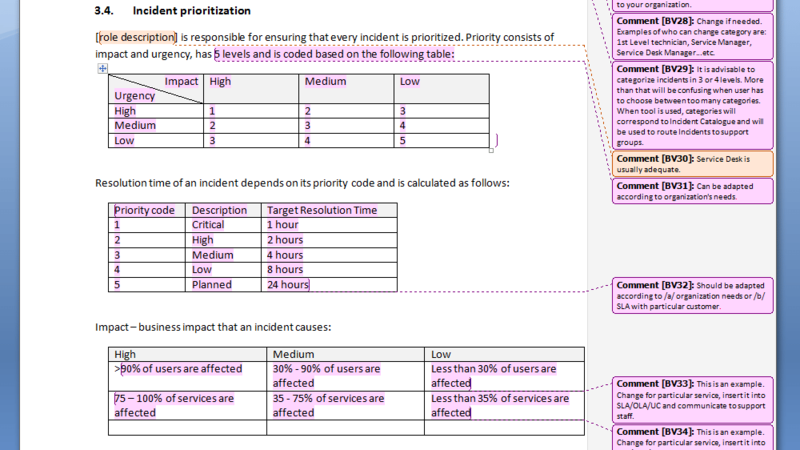 Acceptable for ITIL and ISO 20000 certification audit? – All documents required by ITIL guidelines and ISO/IEC 20000-1:2011 are included, plus other optional policies and procedures that are most commonly used. 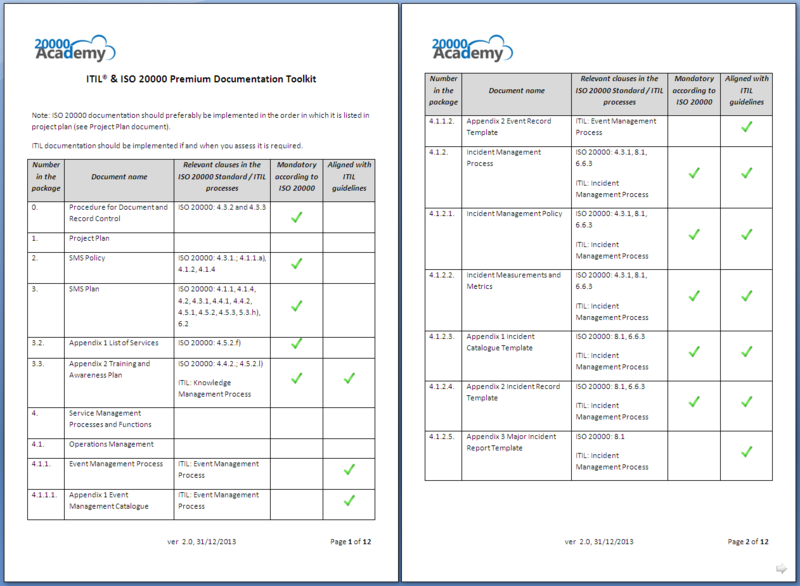 Look at EVERY template in the ITIL® and ISO 20000 Premium Documentation Toolkit – for free! – before making a purchase decision. You will get the complete collection of document templates needed to comply with ITIL and/or ISO 20000. All mandatory documents are included and they are fully acceptable for certification audit. And whichever toolkit you choose, they are available in a range of major languages. For a full list of documents, please click here. We have completed 90% of the documents for you. In most cases you’ll only need to fill in the details specific to your company: business name, the people responsible and anything else unique to your organization. Each document contains comments guiding you every step of the way (including which elements are strictly required). So you won’t have to guess which bits need your attention. You can be sure you’re completing the required documents with speed and accuracy. You can trust the quality and accuracy of our toolkits. You have the peace of mind knowing that every word has been written and reviewed by leading ITIL and ISO 20000 experts. We’ve created the templates to make completion as simple and easy as possible. That means no headaches, no stress and no frustration. All the documents are logically ordered in the exact sequence you need to follow. By completing the steps in the proper order you won’t miss anything important, with no confusion or chance of getting lost. And you’ll avoid wasting months of your time. All the toolkit documents follow exactly the same structure and format to help with the speed and ease of completion. And so you’re not just filling in forms (however easy that makes the process) we also cross-reference all documents so you understand the relationship between them. The ITIL & ISO 20000 Toolkit is designed specifically for small and medium-sized companies to reduce the cost and burden of implementation. For instance, you do not need to complete all the documentation required for a major multi-national corporation Instead we have developed our toolkits with the optimum number of documents required to cover your needs. Webinar designed for companies that are planning to implement ITIL®/ ISO 20000 using the Do-It-Yourself approach. During this webinar you will be able to see whether the templates, know-how, and support from 20000Academy are applicable to your implementation project. We understood your needs, found the answers to your questions, and developed ITIL® and ISO 20000 Premium Toolkit especially for your company. Our toolkit doesn’t require completion of every document that a large world-wide corporation needs. Instead, it includes only those documents YOUR business needs. Can you really implement ISO 20000 by yourself?